Over the summer, your dreams of owning a hot tub probably lay dormant throughout the hot weather and long days. After all, the last thing you want to do when it’s 90 degrees outside is soak in hot water, especially if the hot tub is outside. Now that the days are shorter and the temperatures are cooler, you could find yourself daydreaming about owning a hot tub during another pointless, time-wasting meeting at work. While your coworkers ask stupid questions, you could be wondering what it would feel like to come home from work and immediately soak in your own hot tub. Do you find yourself on the fence about owning a hot tub? 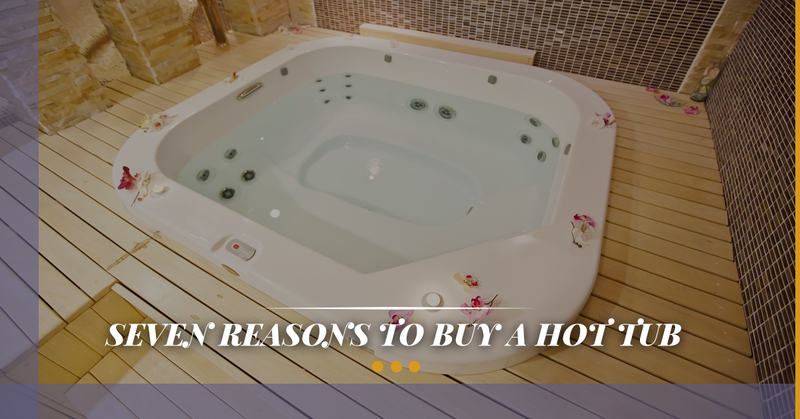 There are so many reasons why buying a hot tub is a great idea. If you don’t have access to a hot tub, the only place you could enjoy a soak could be at the local gym. How will you feel if you go to the gym just to sit in the hot tub? Most likely, you will feel guilty for not working out. Furthermore, your experience will be ruined when the weird, grunty guy from the weight room sits directly across from you and stares into your eyes. No thanks. Why not enjoy your stay at the hotel by sitting in the hot tub? As you walk down the hallway, you envision your peaceful experience only to discover that hoards of screaming children are running around the tub, destroying any notions of peace and relaxation. Naturally, when you see a bunch of kids getting in and out of a hot tub, you will question the cleanliness of the hot tub, as you should. Children are disgusting. According to the Arthritis Foundation, hot tubs help relieve the symptoms associated with arthritis, fibromyalgia, and back pain. Soaking in warm water helps support sore limbs, reduces inflammation, and boosts circulation. Without gravity weighing you down in the water, your joints won’t be compressed. Chances are, after a long day at work, your body feels sore and achy. Marinating in a hot tub offers a drug-free solution to everyday aches and pains. If you sit at a computer all day, a hot tub session could loosen up your tight neck, shoulders, and lower back pain. In today’s modern world, we are constantly looking at screens, including the screens of computers, TVs, and mobile devices. Did you know that looking at screens prior to bedtime stimulates your brain and reduces your sleep quality? Why not hang out in your hot tub instead? By not looking at screens prior to bedtime, you can sleep better. Hot tubs also help temporarily elevate your body temperature, which then follows with a rapid cooling process. When your body begins cooling itself, it begins to prepare for sleep. Plus, we all know that hot tubs are relaxing. When you’re more relaxed, you sleep better. Therefore, if you have trouble sleeping, a hot tub could work wonders for improving your sleep quality. When you soak in warm water, your veins and arteries expand, which opens up more space for blood to flow. You can also help lower your blood pressure because elevating your temperature causes your heart to work harder. Your blood pressure initially increases, which causes your cells to swell. This actually lowers your body’s blood pressure because the dilated cells decrease its resistance. Back in the day, only the wealthiest clientele could afford home hot tubs. However, today hot tubs are more affordable than ever. At Spa Hearth & Home, we offer payment plans so that you can finally purchase the hot tub of your dreams. Check out our extensive show room at our spa store in Maple Shade to get started today.